Sunday was grey and rainy and yesterday was a day of sand in many states - wet and dry, soft and firm, steep and flat. Not great for long distance walking but very scenic and the wind which lifted it up and sand-blasted our legs also allowed the wind and kite surfers to give us a magnificent demonstration of their skills. 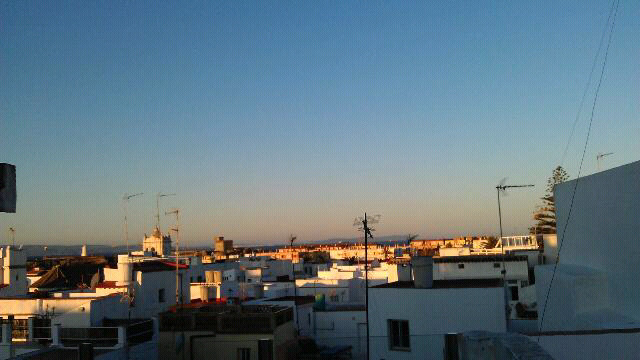 Today we can at last appreciate the view from the rooftop of our bijou residence. Another day walking, we first visit the Roman ruins that are being excavated and sanitised at Baelo Claudia, at Balonia, the huge statue of Tragian (in the Cadiz museum) was excavated from here. 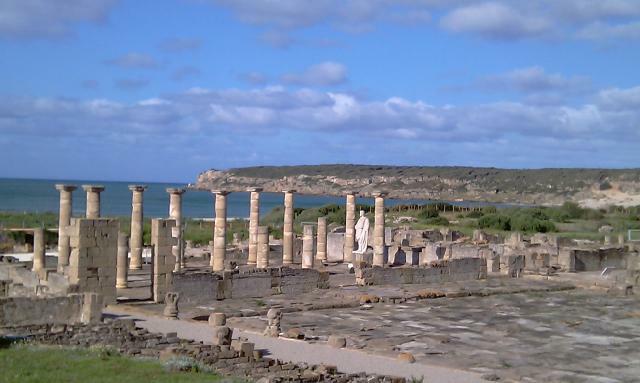 The ruins are fairly well preserved and appear to have been a tuna fishing and salting town for the whole empire, as well as a major crossing to the Empire in north africa after Carthage was conquered in the Punic Wars. We started at 10.40 and covered the 14 miles back to Tarifa in a trifle under 4 hours. Walking on this stretch is both through the chapparal (spanish mediterrnean equivalent of the french marquis) and on the beach. On the streets Tarifa appears to be the kite surfing capital of the world with every other shop selling kite surfers and tuition, today we discovered why as the wind (for them) was apparently perfect. We were impressed by 20ft jumps over 5ft waves as well as the speed and manouvreability of these ?craft. Walking along the sand is tiring though and we were pleased to finish back at the Isla de Palombie at Tarifa very wind blown and sand blasted. Having done two days in one yesterday we declare a tourist day. 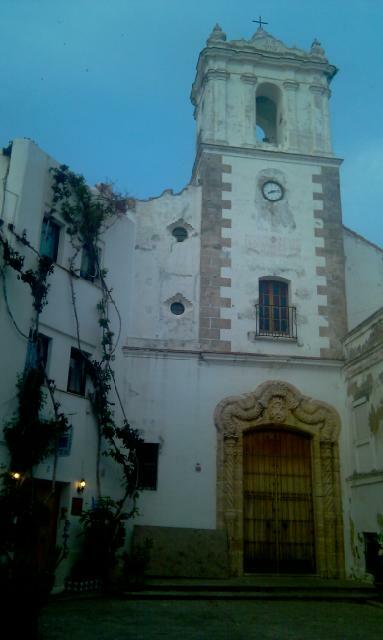 A visit to Cadiz and a look at towns we will pass while walking. Another reason is the weather forecast (a large wet front around midday). Good choice we dodge showers in the morning in Cadiz and learn in the excellent museum (free to EU passport holders) that the name Cadir (phoenician) Cades, (roman) has changed little through the ages. Also there a huge statue of Tragian in the Roman section (an emperor who thought a lot of himself) of whom we may hear more later in thos walk, and some quite good art particularly some Impressionists of whom we had never heard (our knowledge is far from exhaustive) who are probably local. A good lunch in a local bar at 9euro each for 3 courses and a glass of wine, whichi included a large bowl of potato and octopus stew (for Tony and Tim) and scrambled eggs with mushrooms and prawns (for Betsy and Jane). This was preceded (during one of the early downpours) by a quick one in a bar specializing in liquid chocolate. We had a return to Tarifa in heavy rain and called briefly in to the Roman ruins at Baleo Claudia to check opening hours (previously a major settlement now a very small village) to which we will walk tomorrow along the coast from Tarifa. We are driven to Algeciras by Jane who leaves us with the plan to meet us down at La Costa where the Guadalmer (river/stream) meets the sea. There is some doubt to the existence of a bridge here. 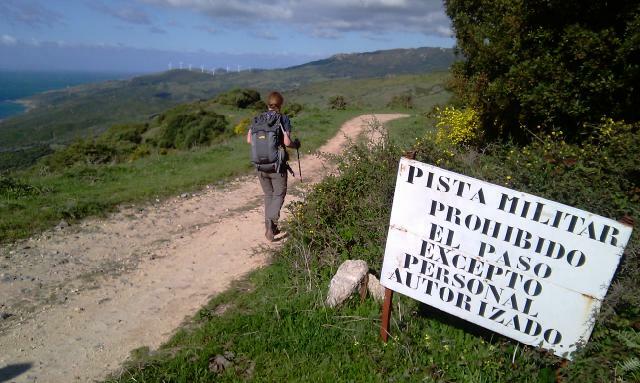 We walk up onto the hills west of Algeciras via an old military road discovering the Camino de Algeciras marked with yellow arrows and crosses as usual on the way. All the many signs prohibiting entry to a military area seem to be from a bygone eras and the occasional machine gun post long deserted. The route is beautiful at this time of year with many wild flowers and birds including more shrikes and various falcons as well as goldfinches and warblers. Alas it is Friday 13th and a text from Jane outlines her difficulty in identifying a road down to our rendezvous, hasty revision of plans occurs leading to a day of 27km instead of 16km and we arrive in Tarifa at 1600hrs after 7hours walking. The coast line in the later stages looks strait across to Morroco and their mobile networks persisted in welcoming us. It has a natural break water of rock strata just off shore protecting the low cliffs. 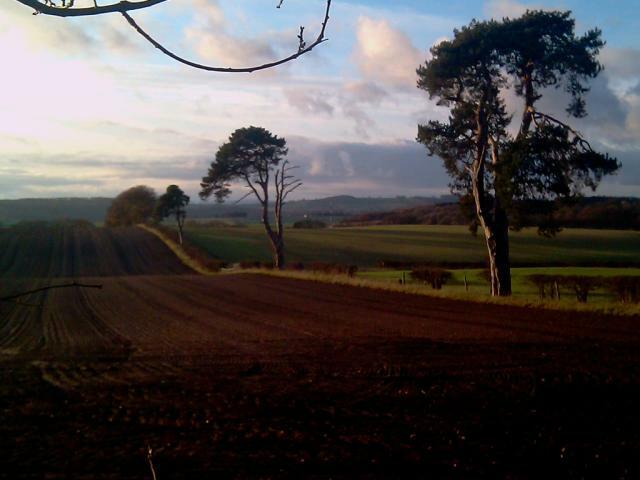 A great days walking even with repeated hat loss due to the strong headwind. A longer day than expected, but the stretch of coastline was very scenic and there were plenty of birds and flowers to look at. 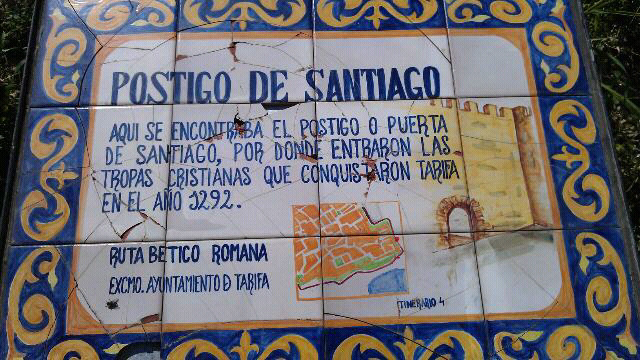 In the final half mile we found a first reference to Santiago. 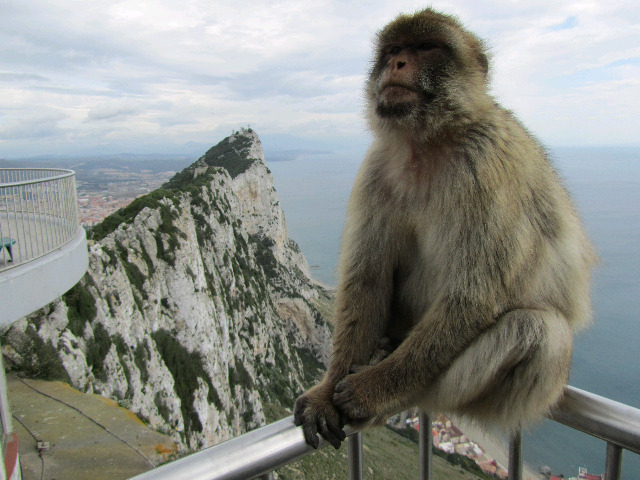 Finally, after what seems like months and months of planning, we are in Gibraltar. We visited the top of the island and talked to the apes before visiting the cathedral to get our Camino passport stamped (by a very nice lady in the office) and had our photo taken before starting on the route. 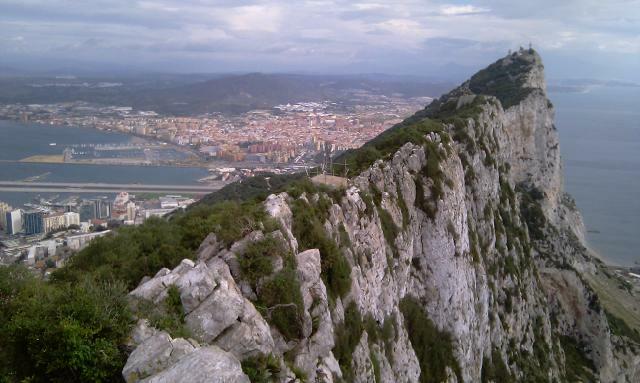 We drive to The Rock, arriving just after 9 and catch the cable car to the top. 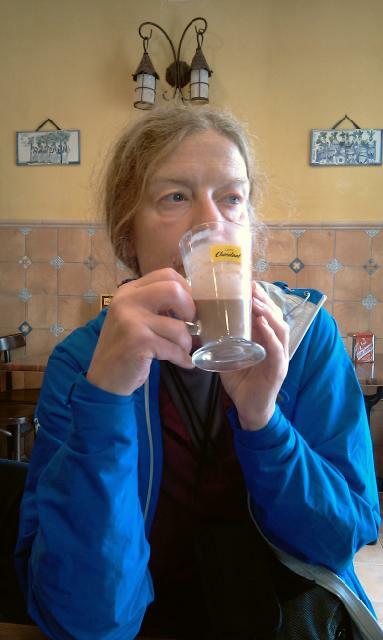 We have 12 miles to walk to Algeciras this afternoon and although some practice has been done it may not be enough! Excuses! We go up the rock in the company of a car full of cruise ship passengers, there are two big ones at anchor under the rock. They seem more concerned by the minor lurches as the cars reach the half way point than possible navigational problems with their hotel. 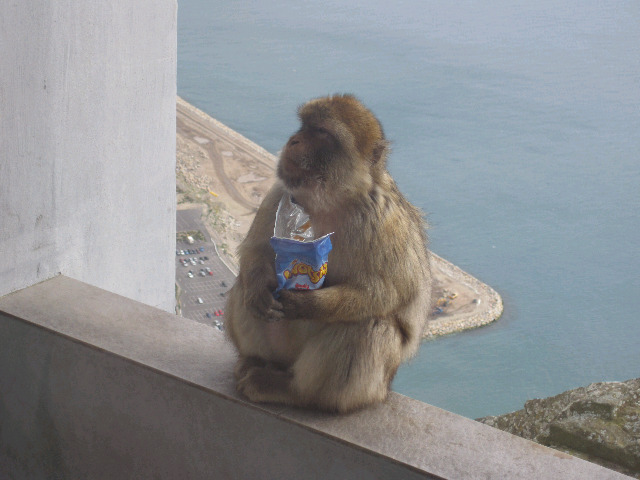 The famous barbary apes elicit a predictable number of oos and aas before demonstrating their cleptomania by grabbing crisps from a child in the cafe and retreating a safe distance to eat them. After talking to the monkeys we descend to get a sello (stamp for our pilgrim passports) from a very pleasant lady in the cathedral office. Setting off back across the runway to La Linea (RAF Gibraltar lands across the only connection with the mainland) after a tapas lunch we start walking around the bay to Algeciras (nothing to do with the arabic radio station). We do not expect to enjoy this walk! It passes through a large chemical works where we see a redbacked shrike and several ?what warblers, followed by a section of high security wall very well decorated by a local art college. 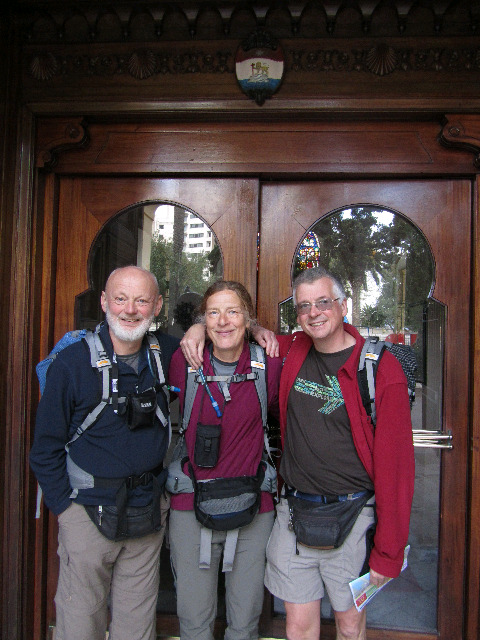 Which goes to show that on Camino the bad and the good are often neatly woven together. The problem with this part of the route is that the two significant rivers that need to be crossed while traversing the bay are most efficiently bridged on the auto route, while there are pedestrian walkways on the bridges it may require multiple leaping of crash barriers to get to them! The latter part of this section is dangerous and tedious. The possible footbridge over the Rio Guadarraque is in fact a pipeline from one bit of chemical works to another. Eventually we make our way through the back streets of Algeciras to the cemetry in the middle and meet up with Jane and our lift back to Tarifa. The next day looks better but may be worse who knows? Having stumbled yawning out of bed at Tony & Janes in Somerset and made our way to Bristol airport we check our small (less than 10kg) packs through Abnormal Baggage (Cos of the straps) we board Easyjet flight to Malaga. An uneventful flight and hire car pick up and Jane drives us a little hesitantly to Tarifa. The most southerly town in the Iberian peninsula, where we have a flat for a week as a base to walk around from Gibraltar to Jerez (or there about). This may seem a luxurious start to our Camino but the distances are full days and we hope to fit in sight seeing in Gibratar and across the straits in Tangiers while Jane is with us. This old town much fought over is full of history with Guzman the good and PanchoIV capturing the town at various times. 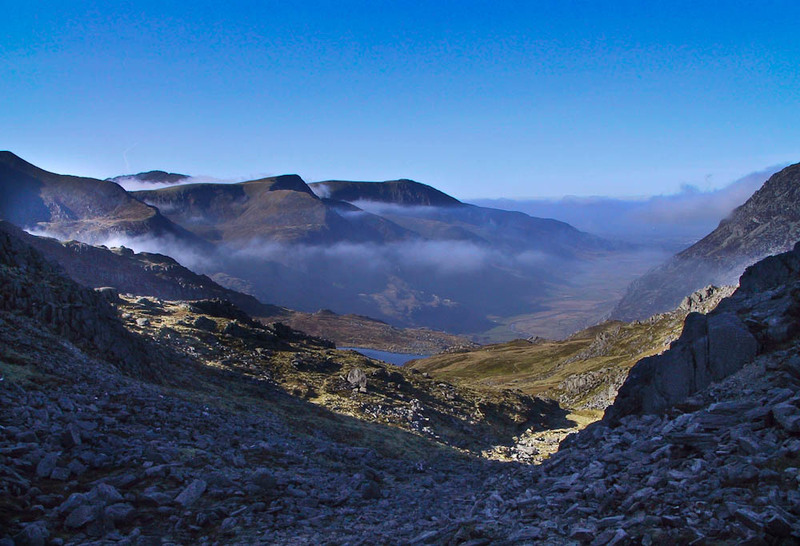 The usual suspects met in Dolgam campsite Capel Curig last weekend and experienced remarkable weather. This inspite of Rays insistence he had booked the usual rain low cloud and high wind. A temprature inversion allowed us to experience sunshine on the peaks with cloud in the valleys and the occassional brockenspectre. I hope this works. Picture from practice walk near home.